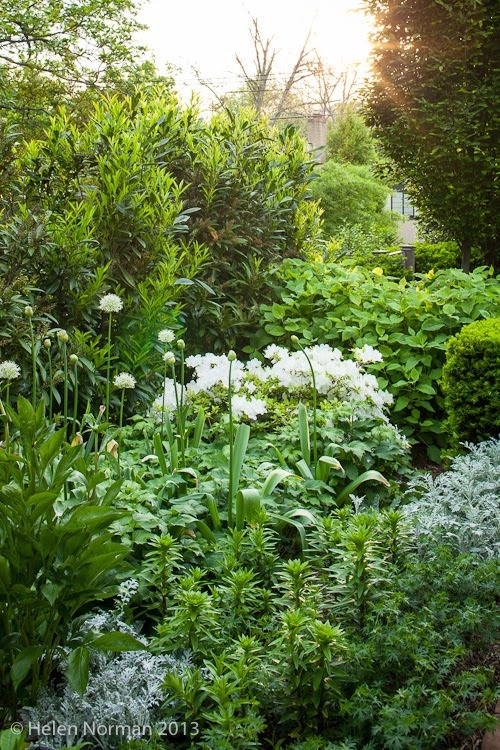 As self taught gardeners, Tom and I spend a great deal of time and effort designing, cultivating and nurturing our gardens. We've planted every single tree, shrub, perennial and bulb ourselves. 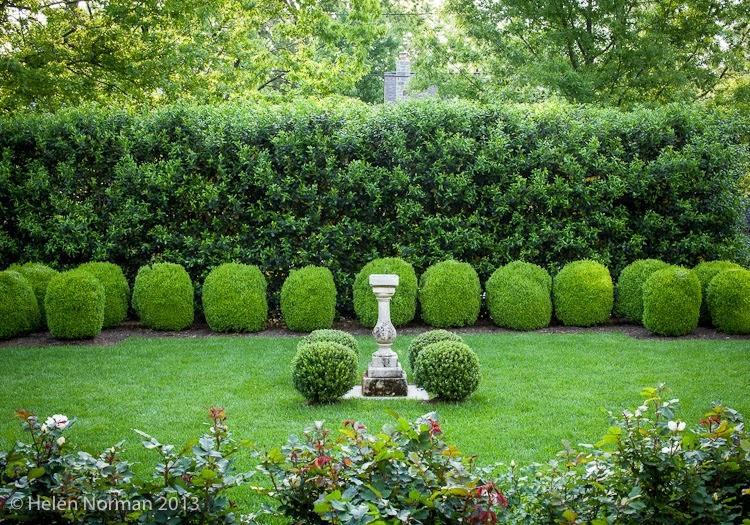 We also do all the pruning, watering, weeding, etc., etc. 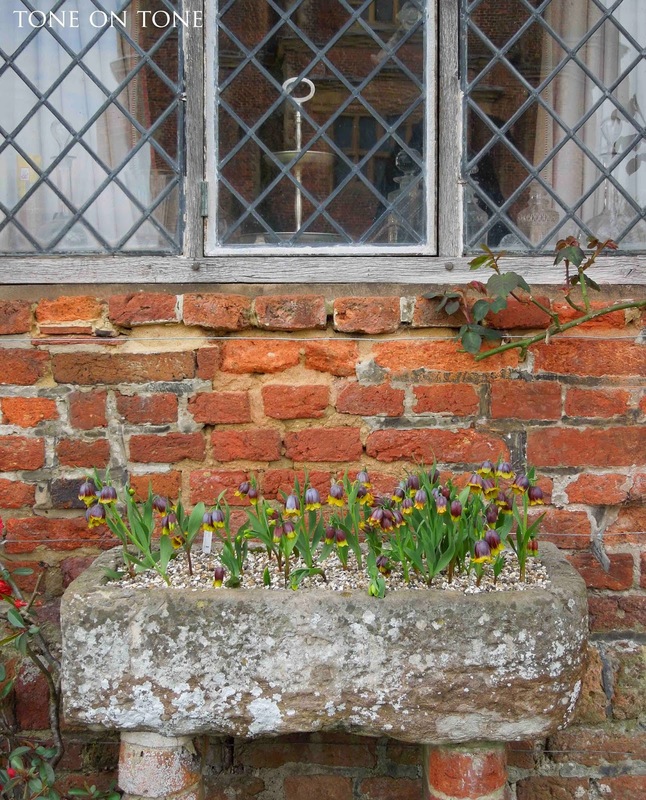 Of course some plants just don't make it despite all the TLC - perhaps we ought to try benign neglect? That seems to always work on weeds! 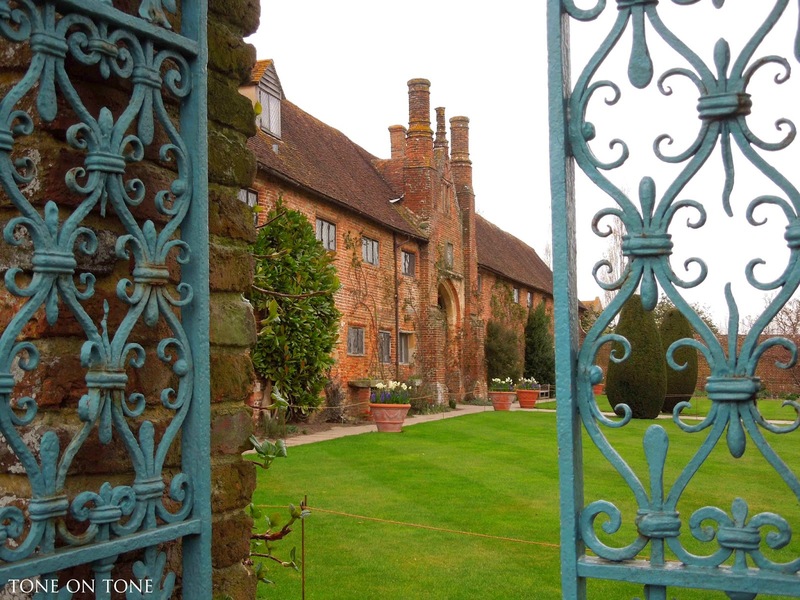 On the topic of gardens, those of you following me on INSTAGRAM know of our recent visit to Sissinghurst in England. Why a visit this early in the season? 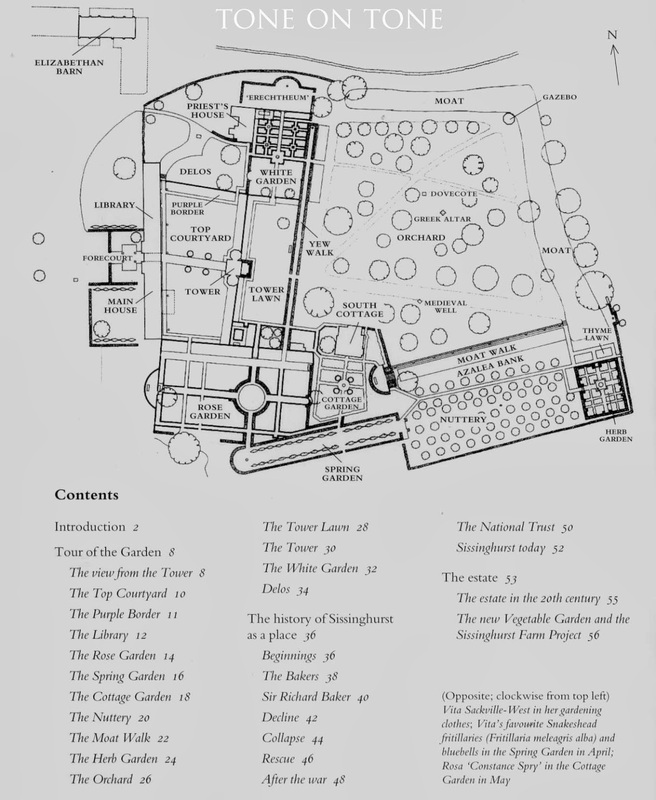 We were interested in studying the bones of this fabled garden. 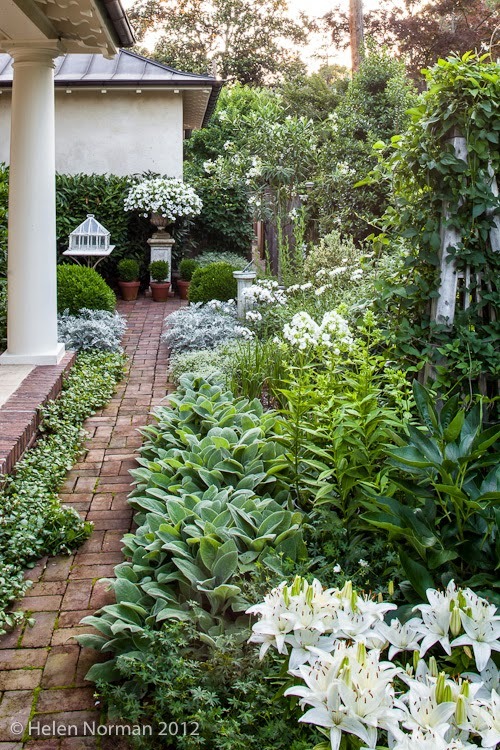 A well designed garden should be pleasing in all seasons. 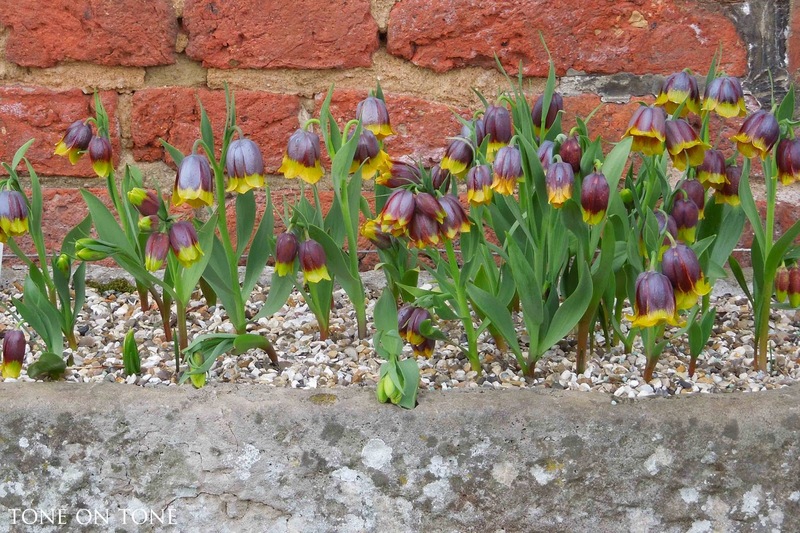 Plus, the early spring bulbs were in bloom - so, why not? 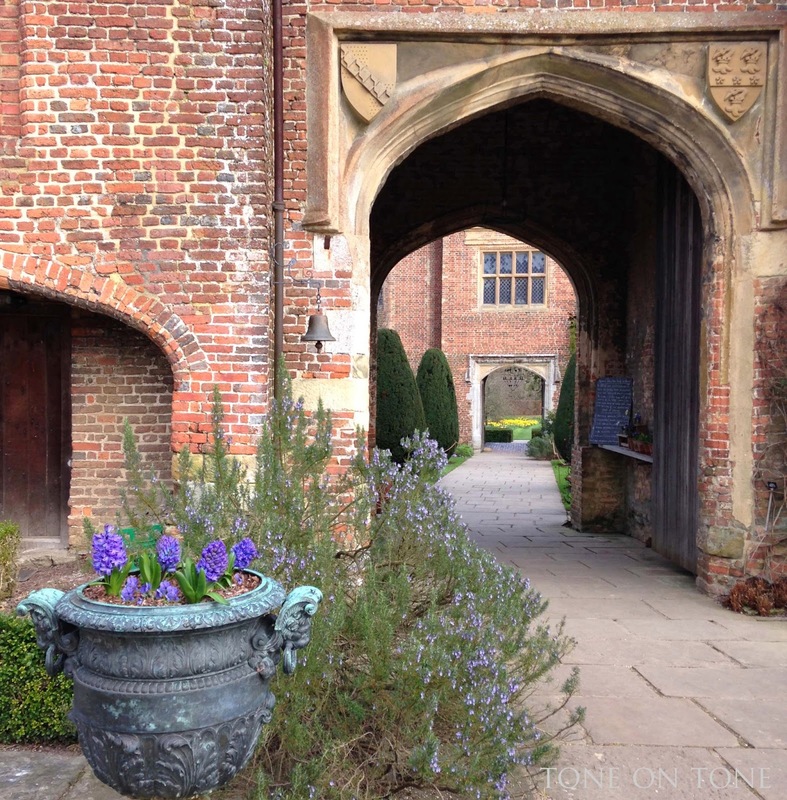 It was quite pleasant to stroll through Sissinghurst without the crowds of people. This is an extremely popular destination during high season, so if you visit, join the queue just before opening. Enjoy! 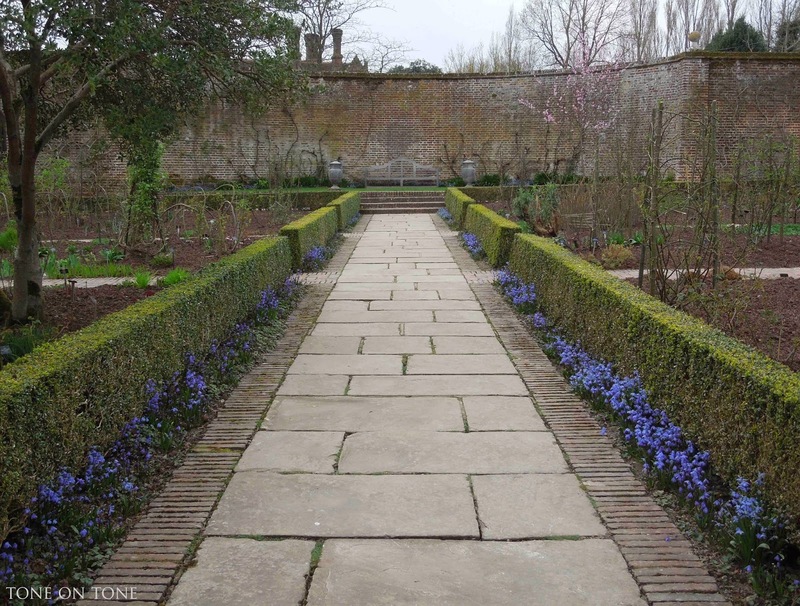 In the 1930s Vita Sackville-West, poet and gardening writer, along with her husband Harold Nicolson, author and diplomat, started this garden. 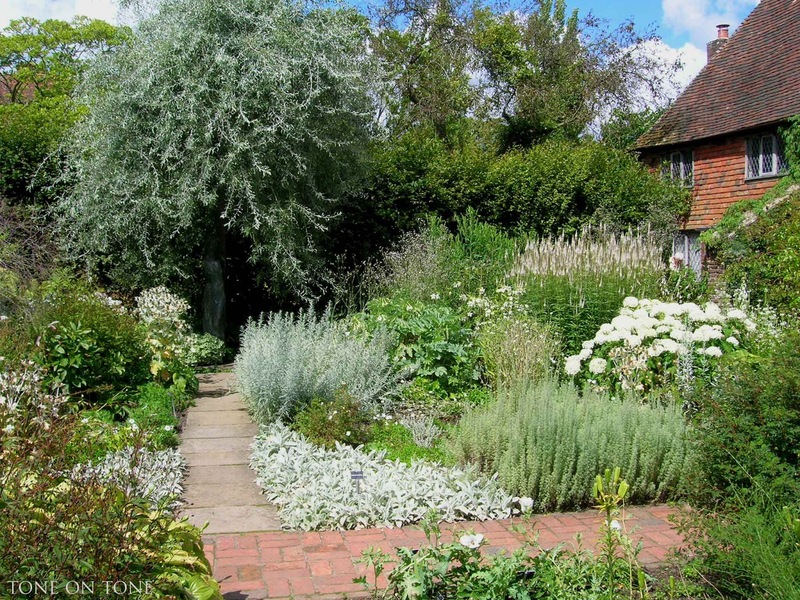 Sissinghurst is more than a garden. 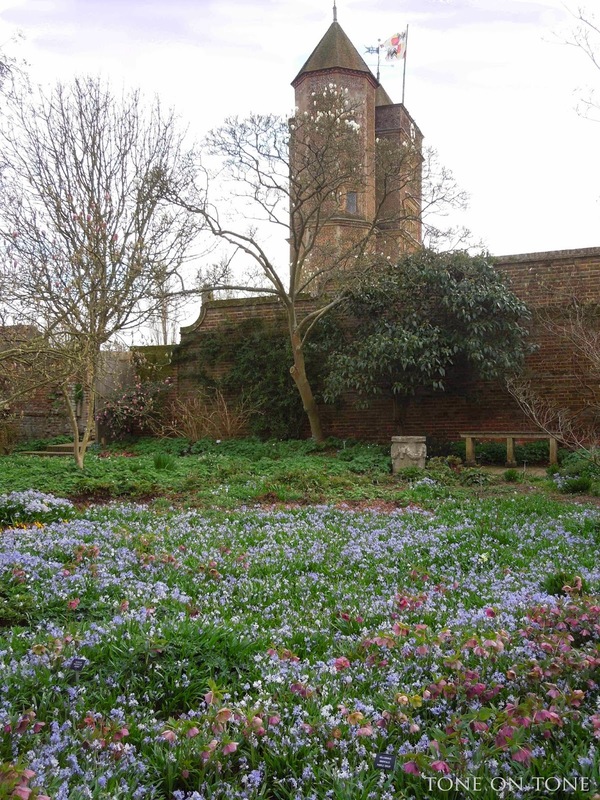 It is a garden in the ruin of a great Elizabethan house, set in the middle of its own woods, streams and farmland and with long views on all sides across the fields and meadows of the Kentish landscape. 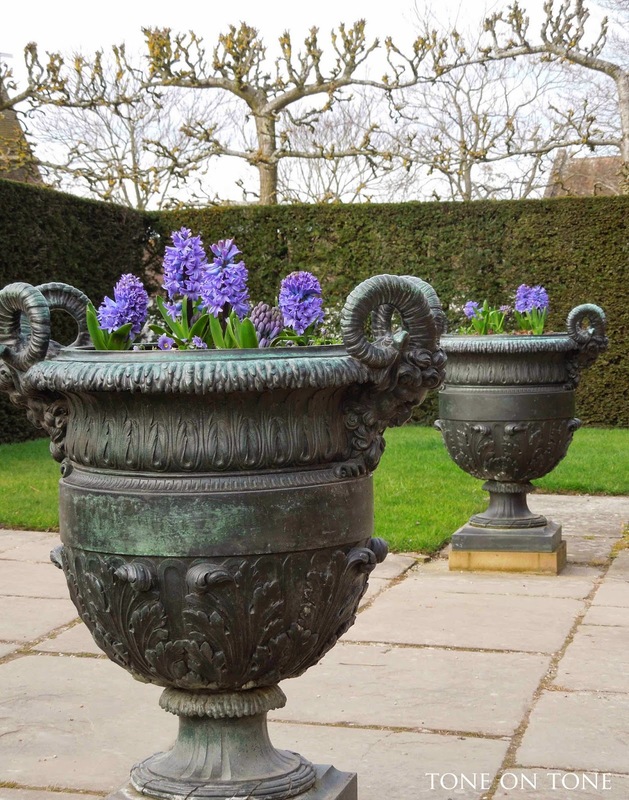 Visitors are greeted in the Forecourt by heavenly hyacinths in 19th century bronze urns. 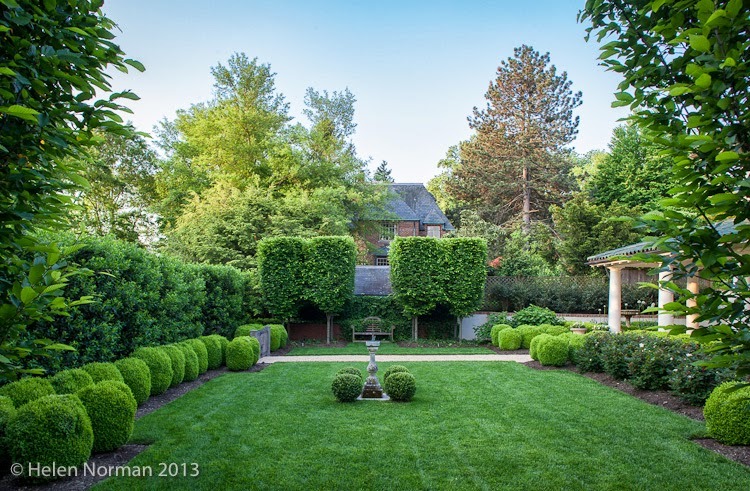 BELOW: Notice how the pleached trees above the yew hedge create an outdoor room setting. 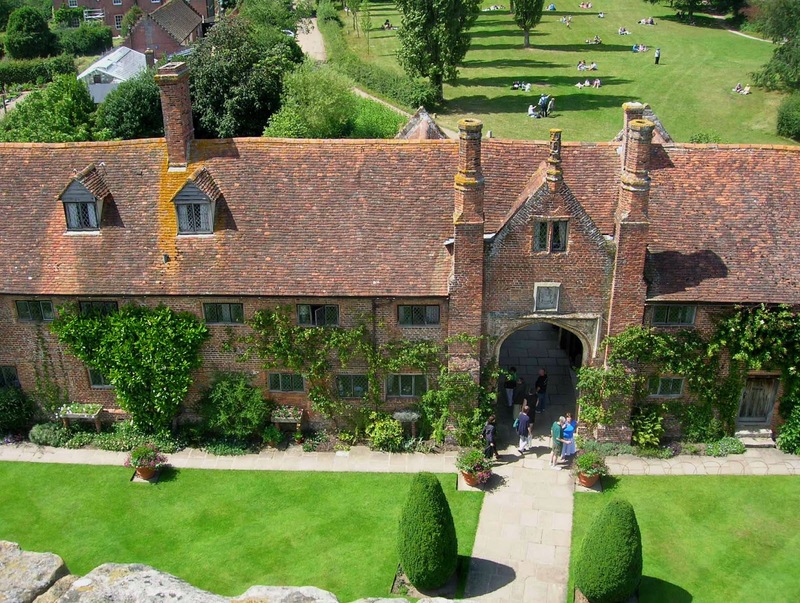 Sissinghurst is famous for its garden rooms delineated by hedges, trees and walls. 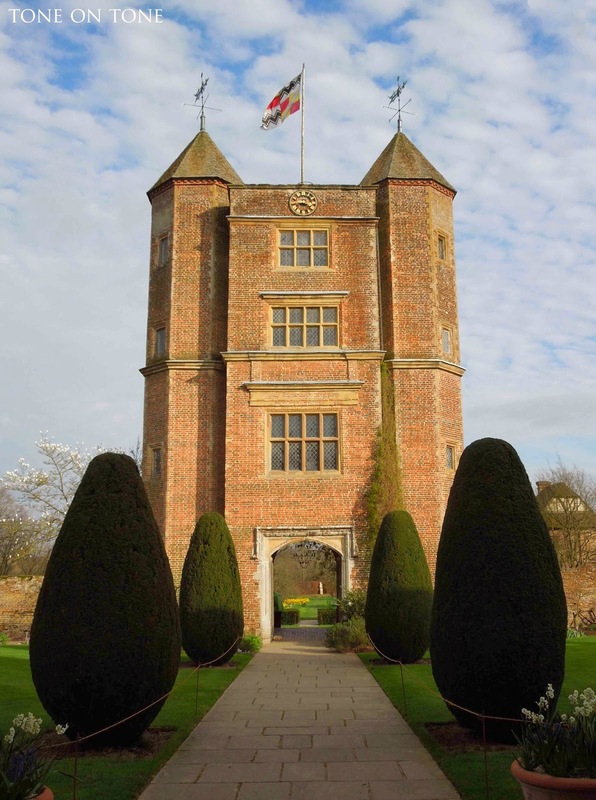 The 16th century Elizabethan Tower is a good place to begin the tour - climb up to the top for stunning panoramic views! We didn't go up this time, but have done so in the past. (See photos from a previous trip at the end of this post.) Vita's workroom / office is located in the Tower so don't miss it. 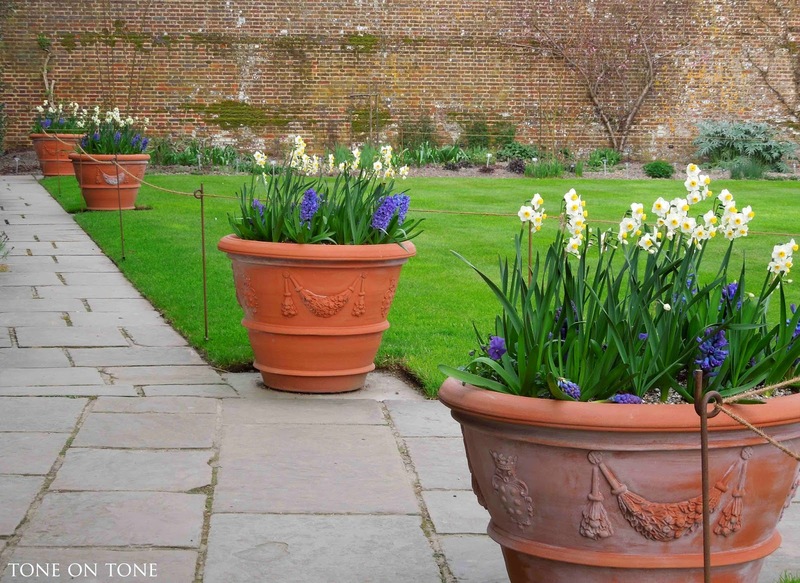 The Top Courtyard with potted bulbs edging a fresh green lawn. 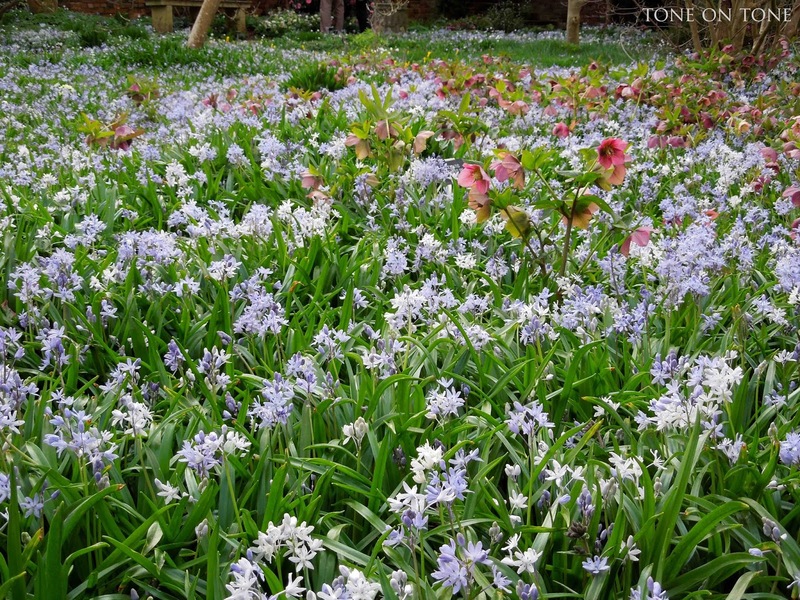 A dazzlingly display of anemones, chinodoxias and scillas blanketing the Delos in March. 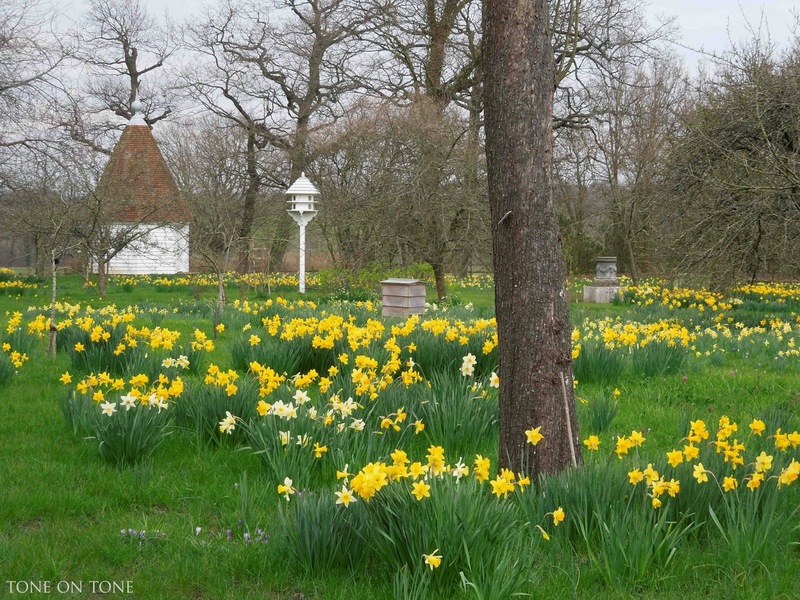 Drifts of daffodils carpeting the fields of the Orchard. 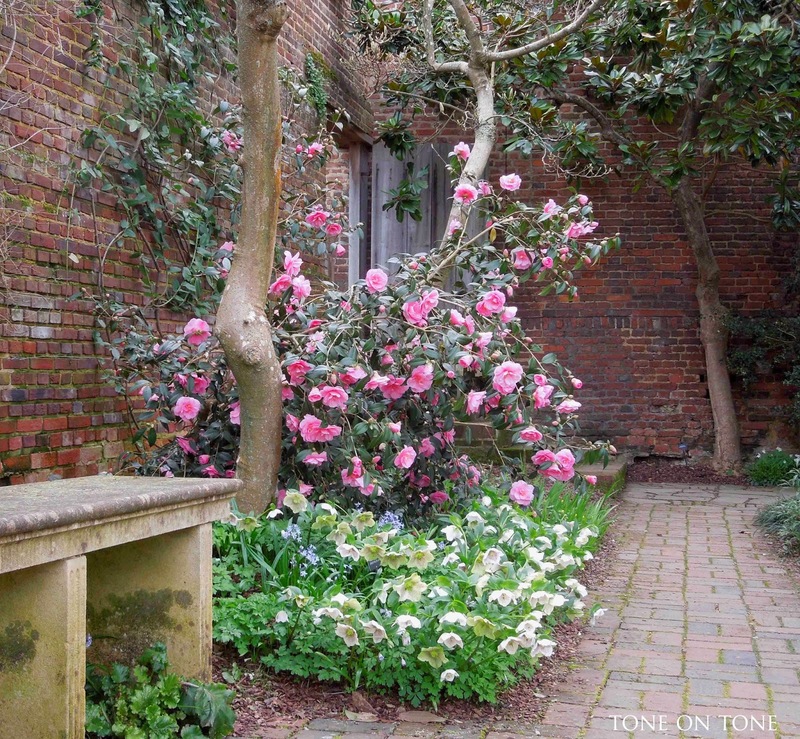 Ushering in spring are two of my favorites: camellias and hellebores. 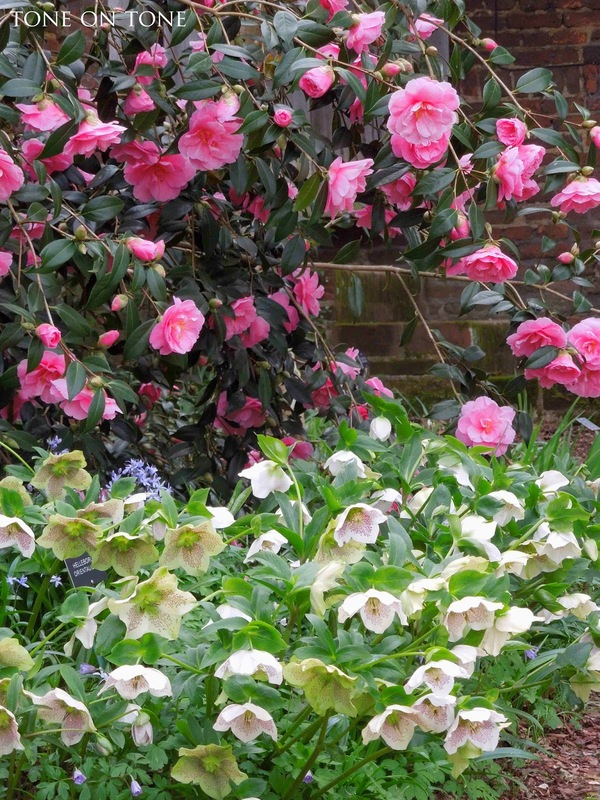 Both shade-loving evergreens bloom about the same time, although certain varieties of camellias flower in the fall. 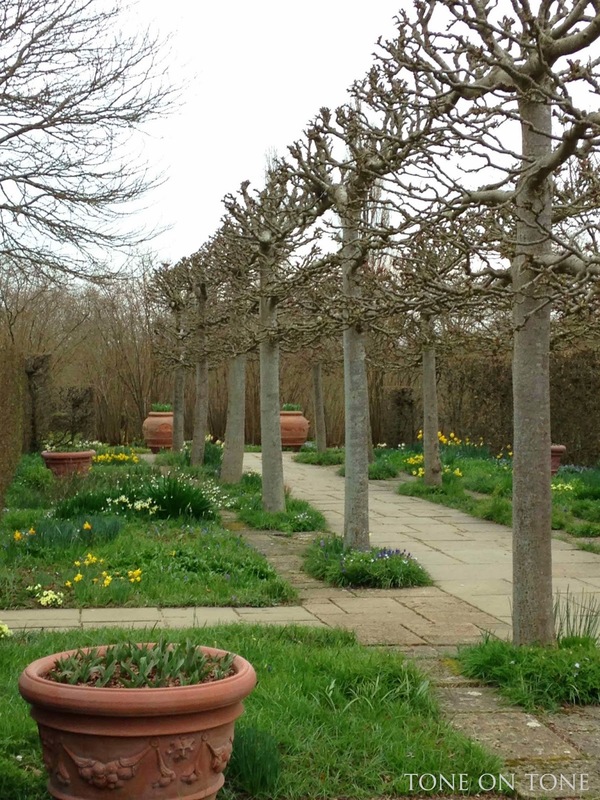 An allee of pleached lime trees in the Lime Walk. Tom was especially interested in seeing how these trees were pruned. They look like sculptures! 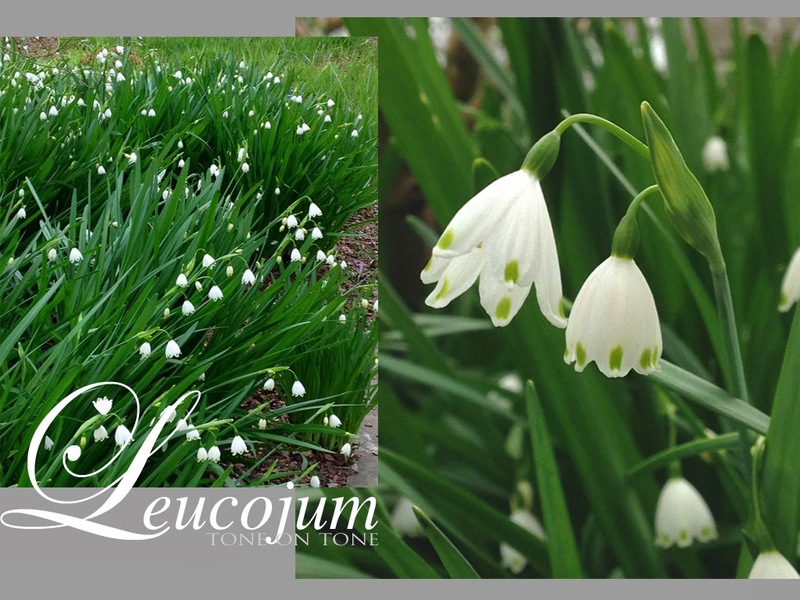 Leucojums (above) burst into bloom, while the elusive Snakeshead fritillaries (below) made a more subtle appearance. 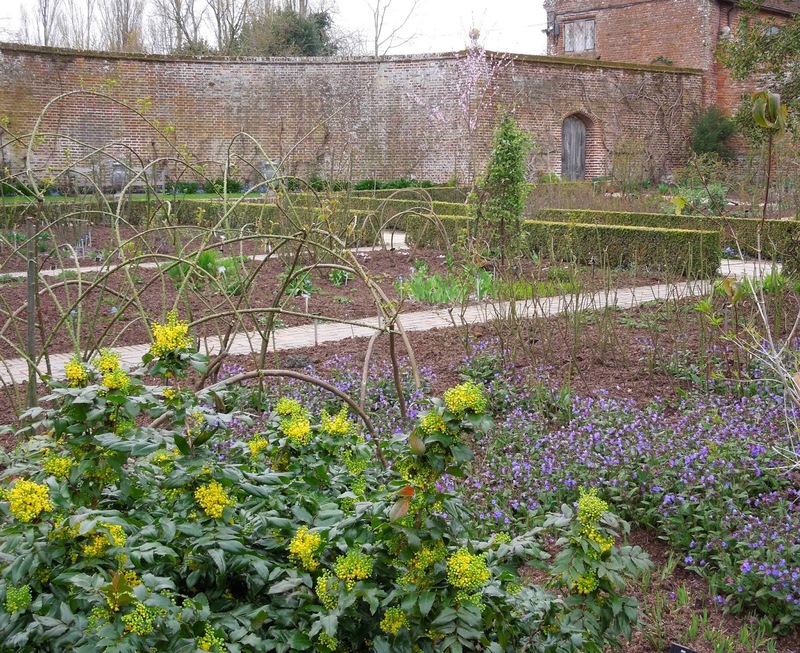 All is neat and tidy in the Rose Garden. 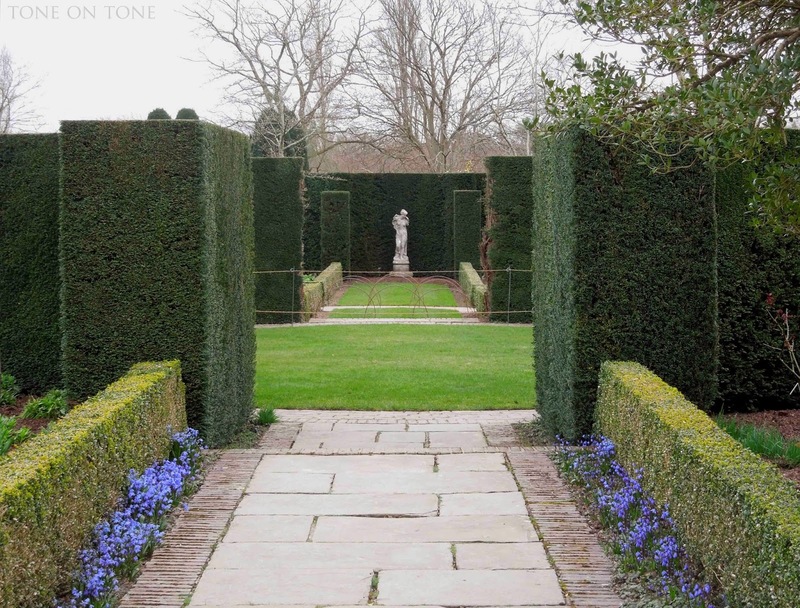 The box and yew hedges were perfectly clipped. 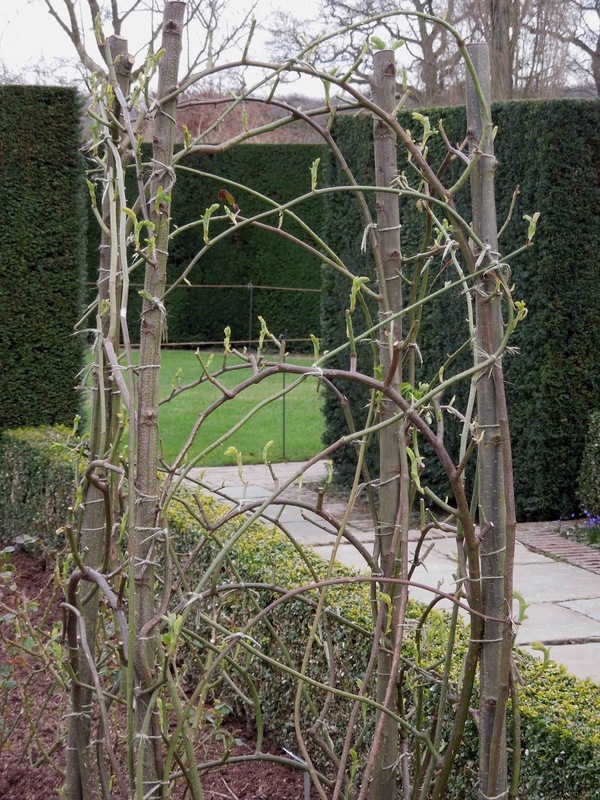 Roses, clematis and other plants are trained on structures made from hazel branches - so organic! 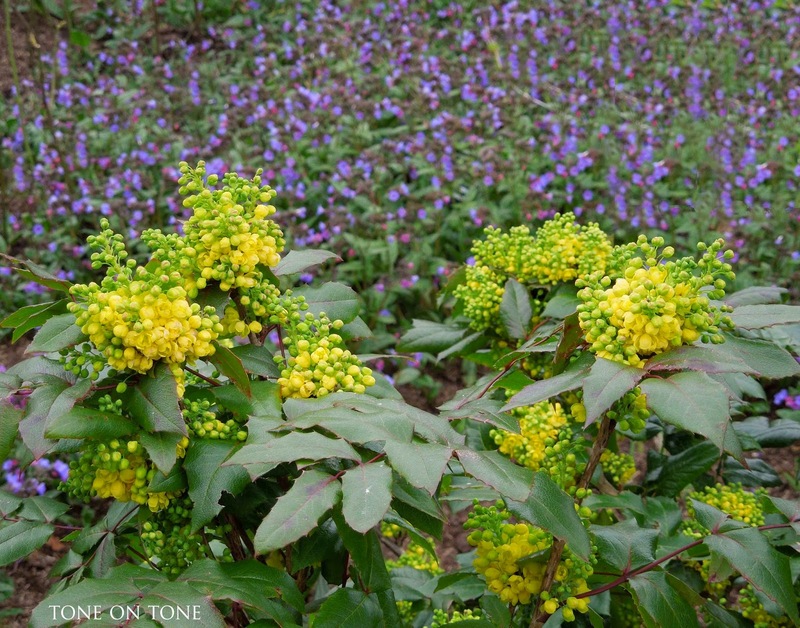 A cheerful combination of yellow Mahonia and lavender-blue Pulmonaria flowers. 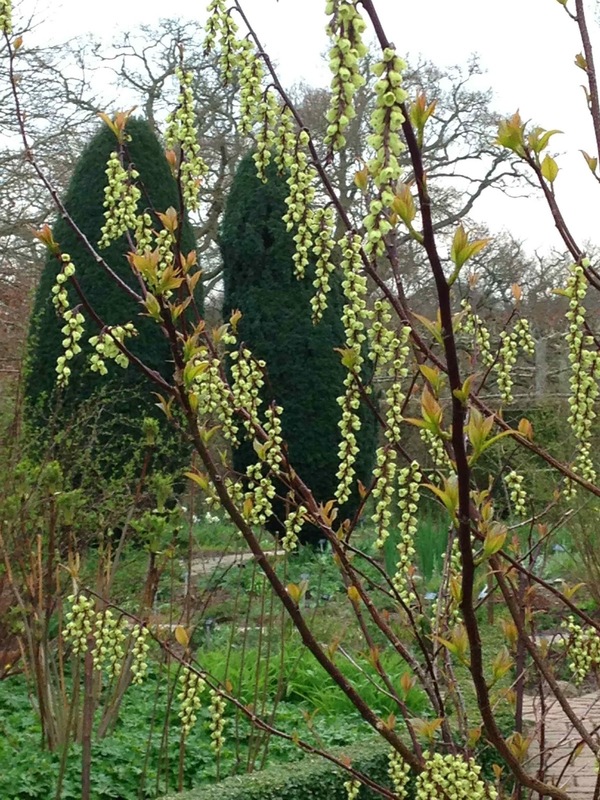 BELOW: I believe this Stachyurus Chinensis Celina shrub is quite rare. 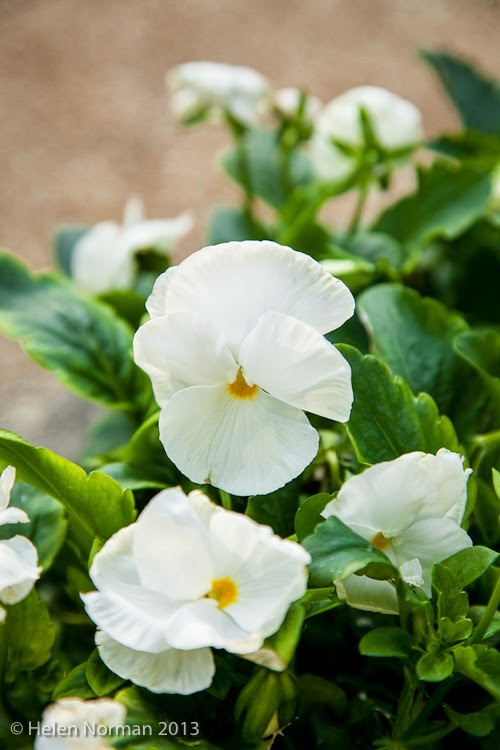 The pale yellow flowers look especially pretty and delicate in the early spring landscape. Now some photos from a previous visit in late July. These were taken just a little past 11:00 AM soon after opening. Two bird's-eye views from the Tower. 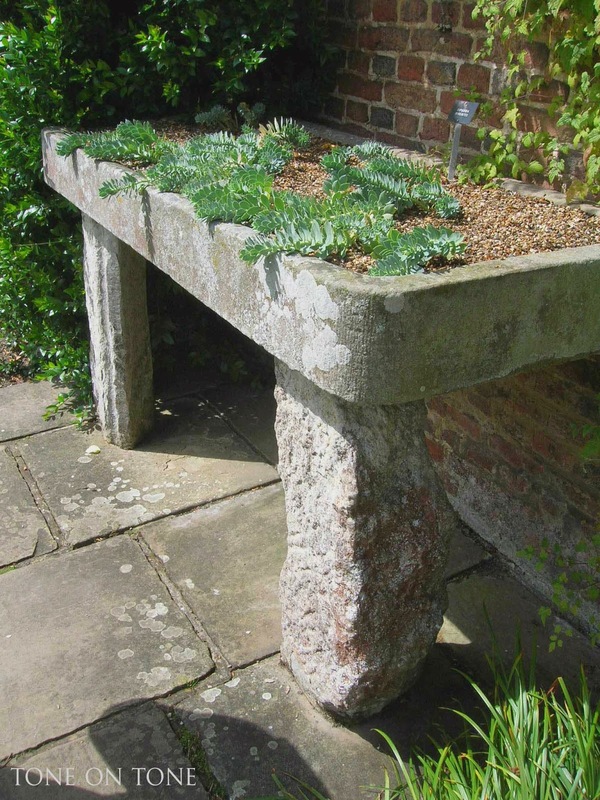 A shallow trough planter in summer. 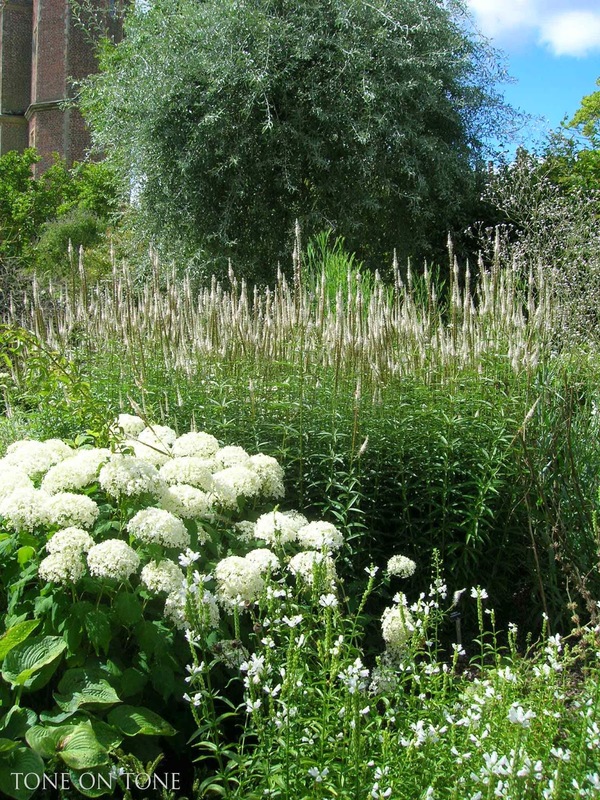 Pure bliss in Sissinghurst's lengendary White Garden! 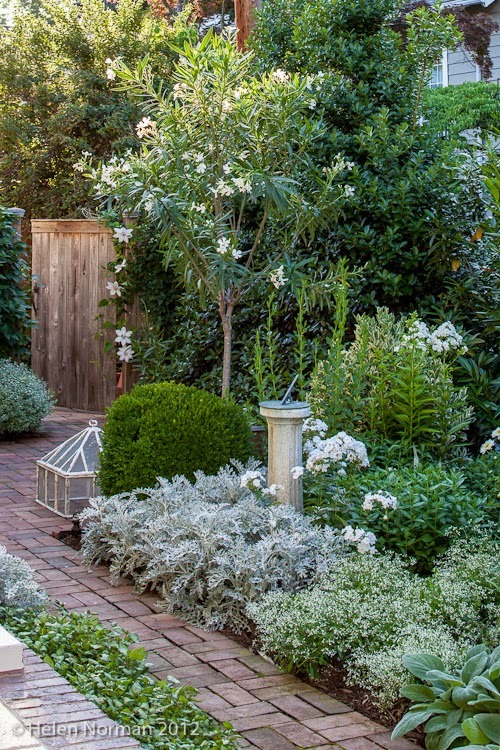 I've drawn much inspiration from this glorious garden's plantings and color palette of whites, silvers, grays and greens. PS - Next post we journey to Paris! 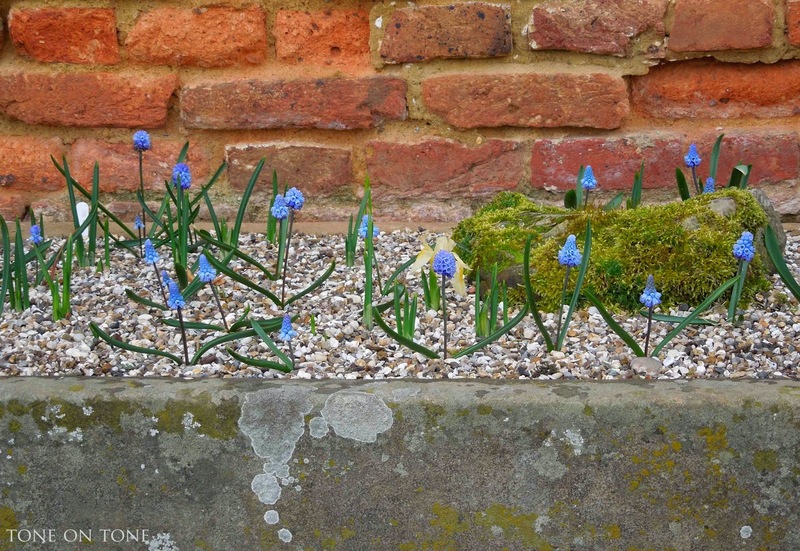 We made it: spring at last! 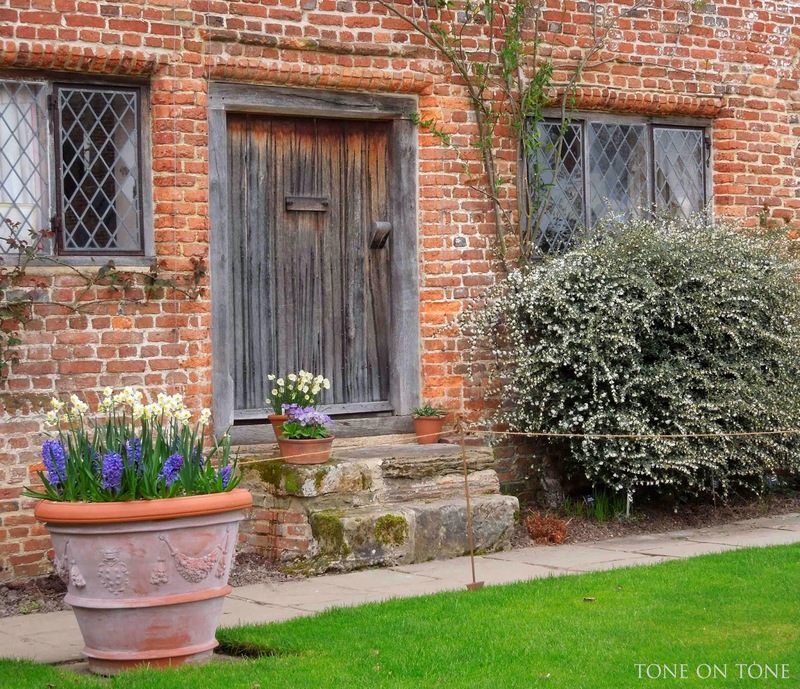 After a long, cold winter, this gardener is elated to see signs of spring - from the return of the songbirds to the earliest daffodils blooming cheerfully. I welcome the warmth of the sunshine melting the last patches of snow. Winter be gone! 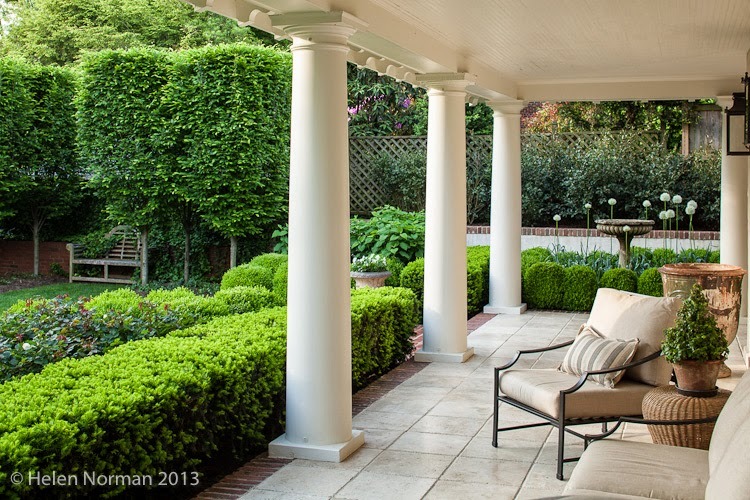 As if this lovely first weekend of spring wasn't enough, I'm thrilled to report that our garden is featured in the April 2014 issue of Southern Living! 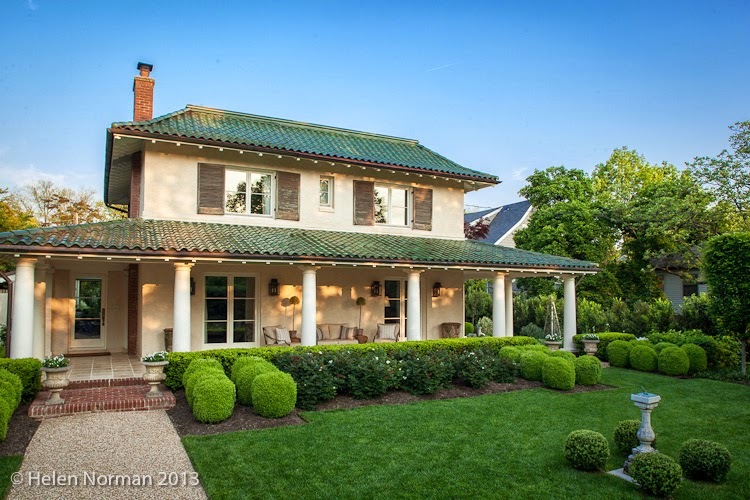 Many thanks to Southern Living for making this spring even more special. 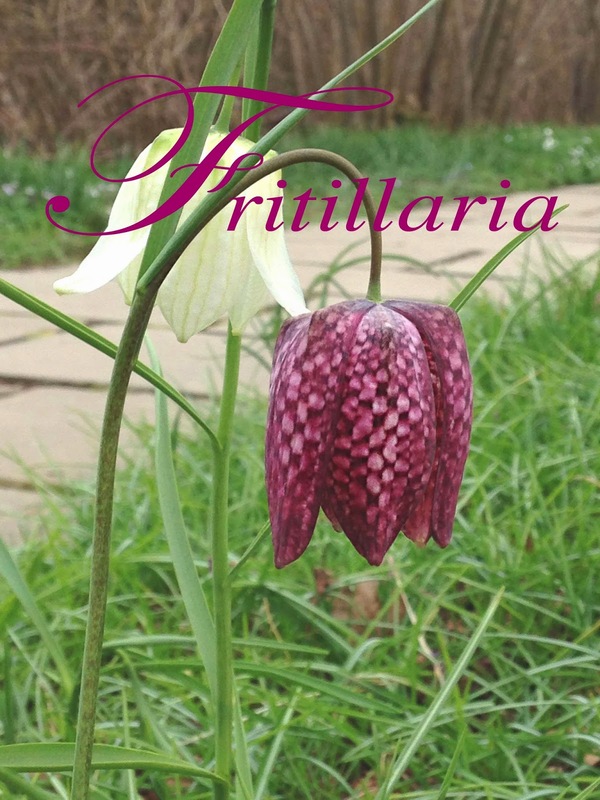 I am so grateful for their continued support - check out my topiaries here, here and here. Also, read about our shop here. 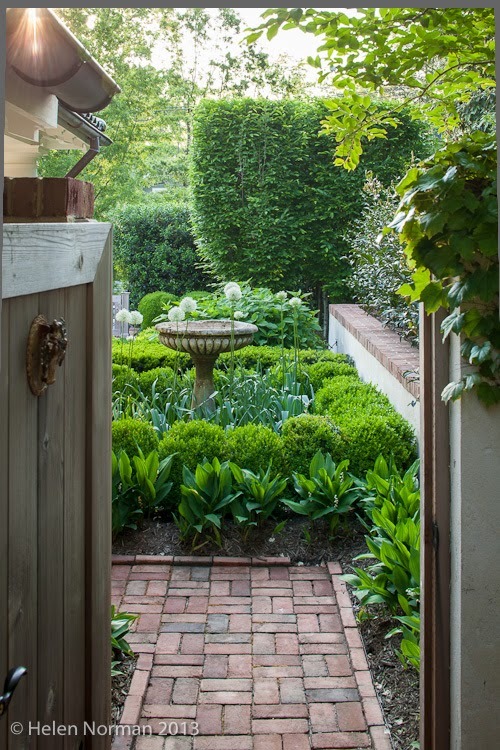 Garden Editor Rebecca Bull Reed sensitively captured the spirit and soul of our garden. 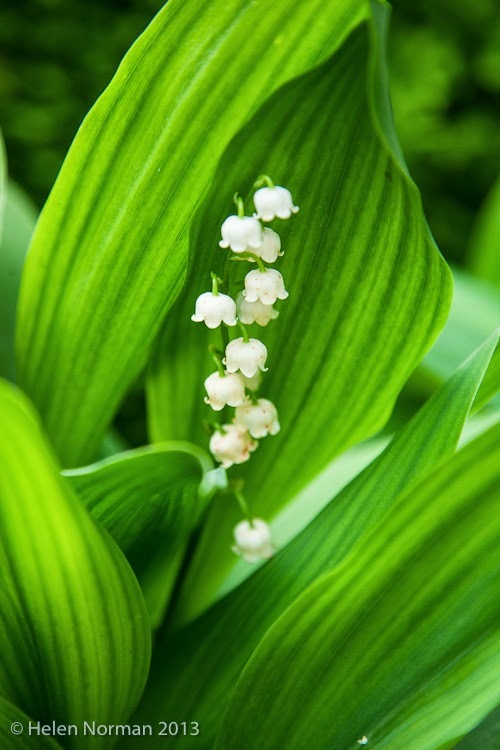 That's because Rebecca is an accomplished and enthusiastic horticulturalist who thoroughly understands the challenges and rewards of gardening. And you know the adage "a photo is worth a thousand words," well, photographer Helen Norman's brilliant photos are beyond words. Helen can make even a dreaded dandelion look like the jewel of the garden - she's that good, and her passion for her craft shows. Thank you, Rebecca and Helen! 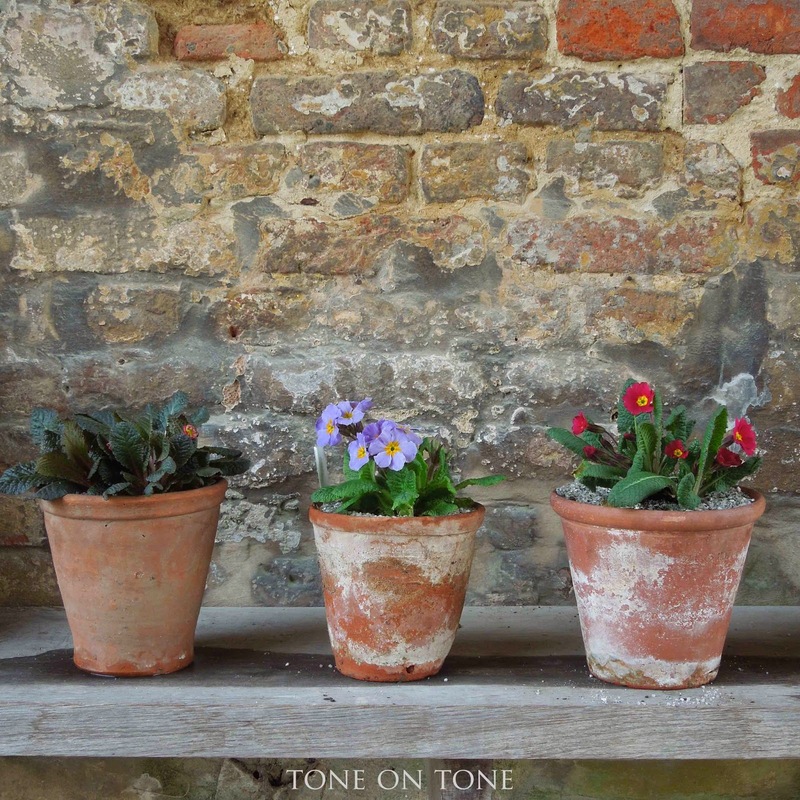 The article is presented as five separate sections with design ideas, informative tips and plant recommendations for a tone-on-tone garden. 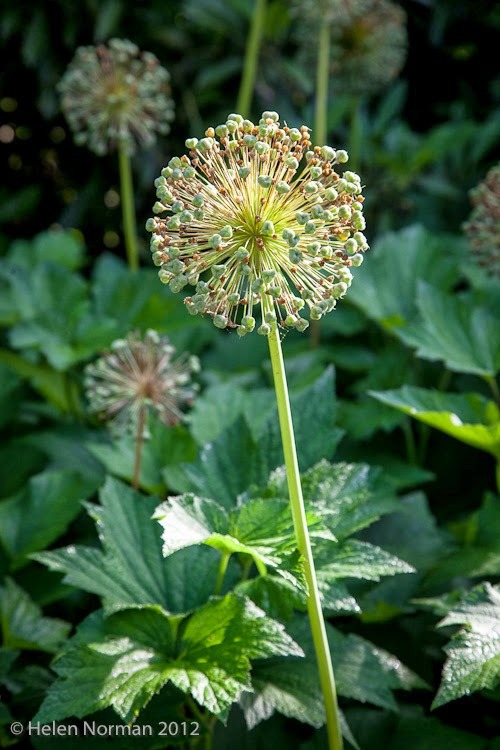 Enjoy these beautiful photos taken by Helen throughout spring and summer of 2013. 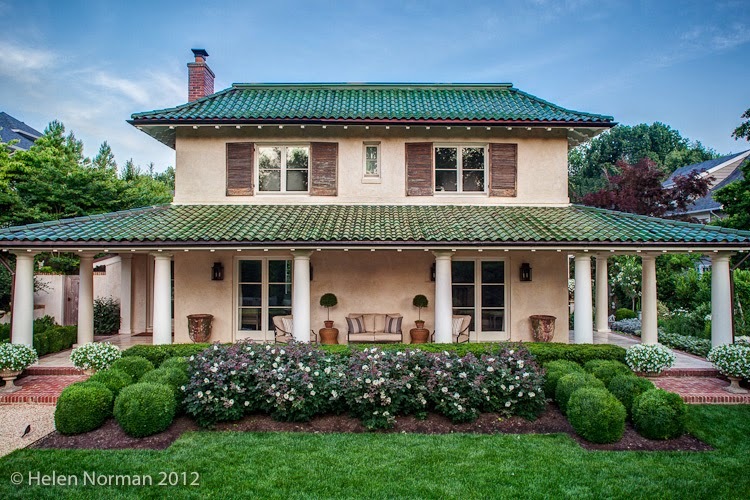 An early spring shot with fresh new growth on the English boxwood balls and low yew hedge behind. 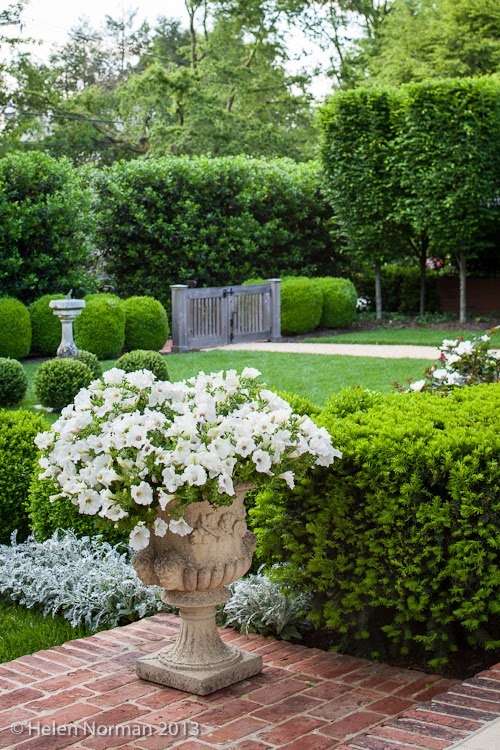 The four urns are planted with white pansies. 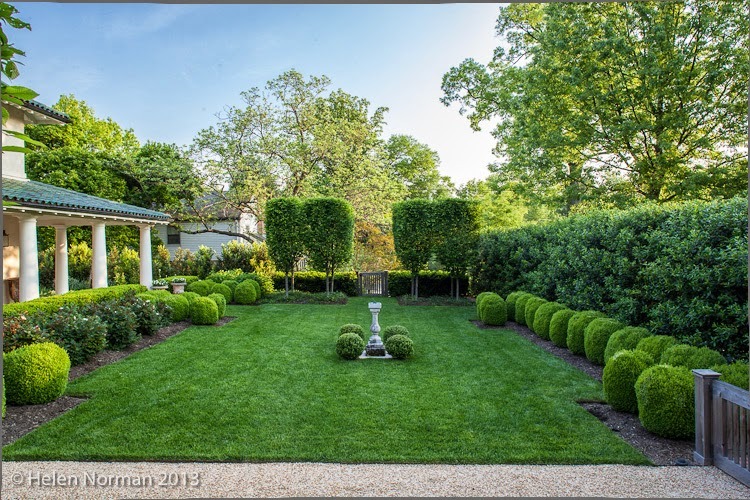 Two views of the front lawn showing the eight freshly sheared European hornbeams anchoring each end of the garden. Tom does an amazing job of shaping these 16 trees! 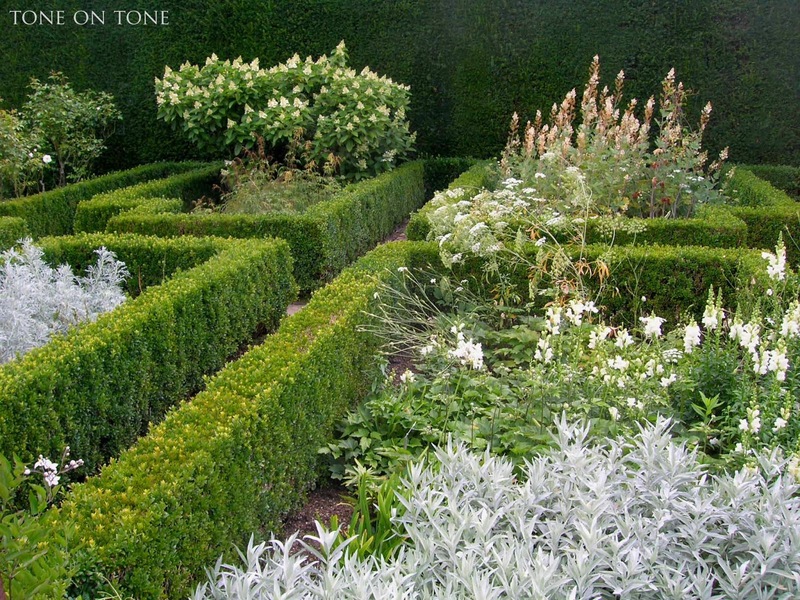 A better look at the chartreuse yew hedge which will darken to a deep green, becoming a dramatic backdrop for the white roses. 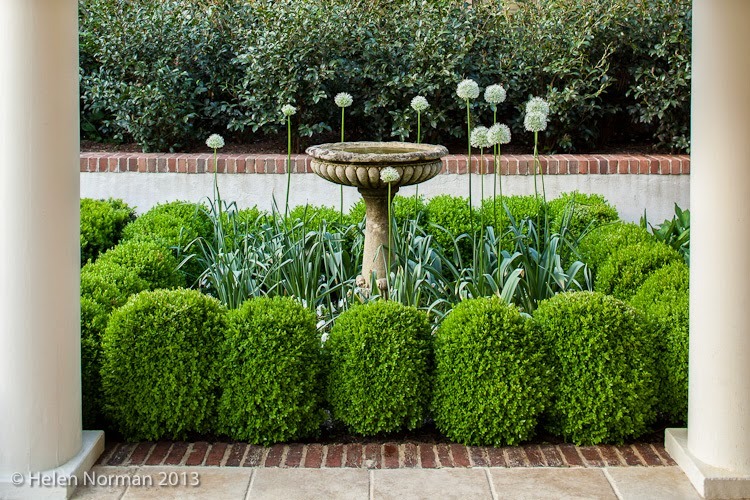 From the front loggia, a view of the birdbath surrounded by more English box and white alliums. 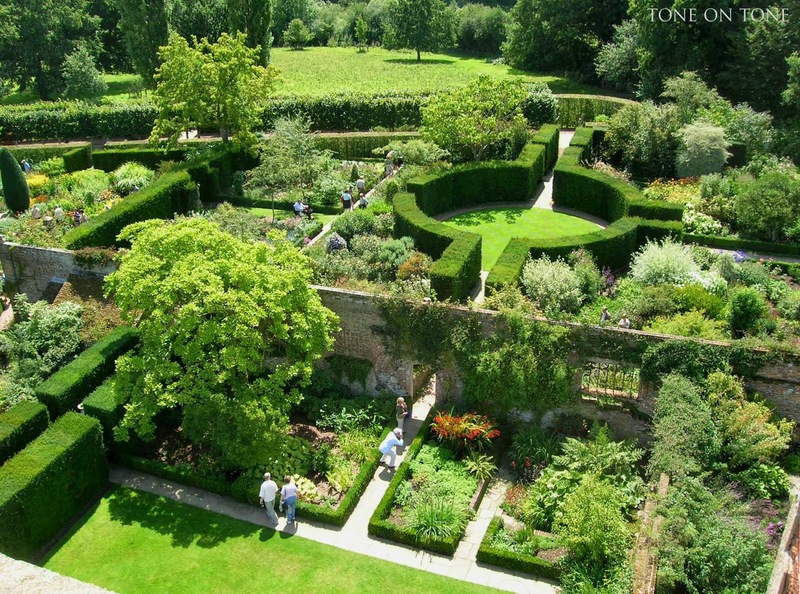 The same parterre as viewed from the small courtyard. Two stunning portraits by Helen Norman - these are among my favorites!! 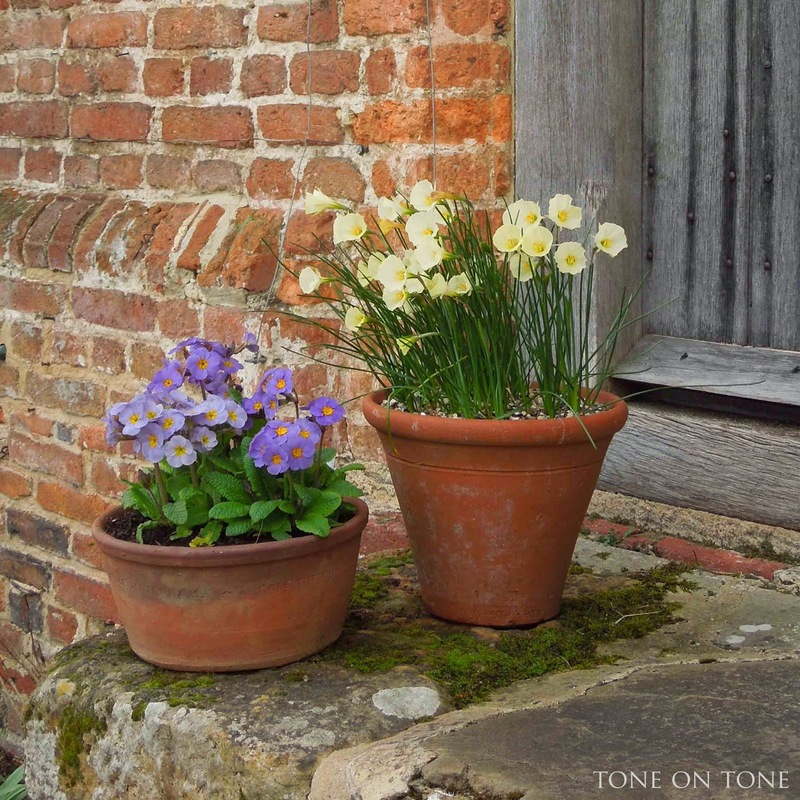 During summer, I replace the pansies in the urns with petunias. 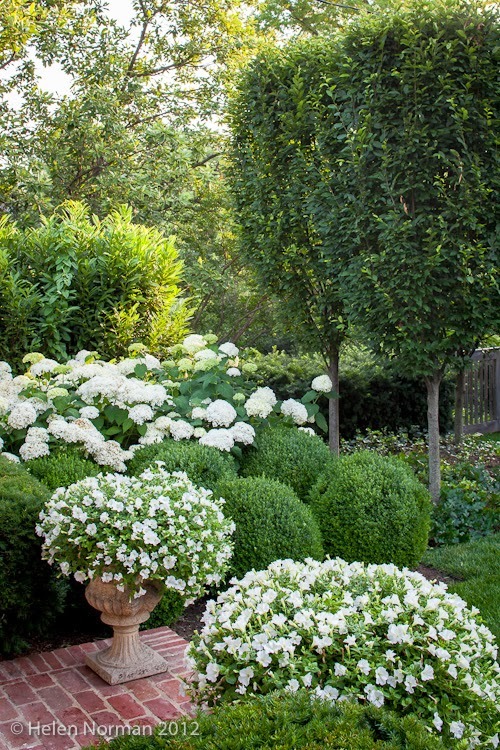 The Annabelle hydrangeas are especially beautiful in June. 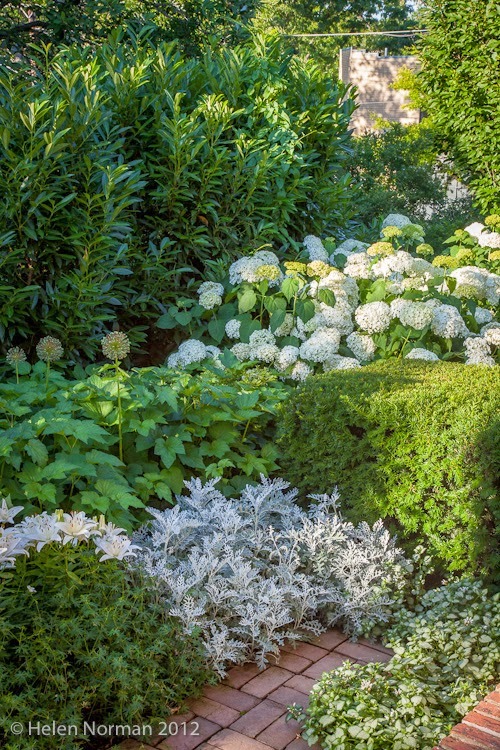 This is the white border garden on the north side of the house. 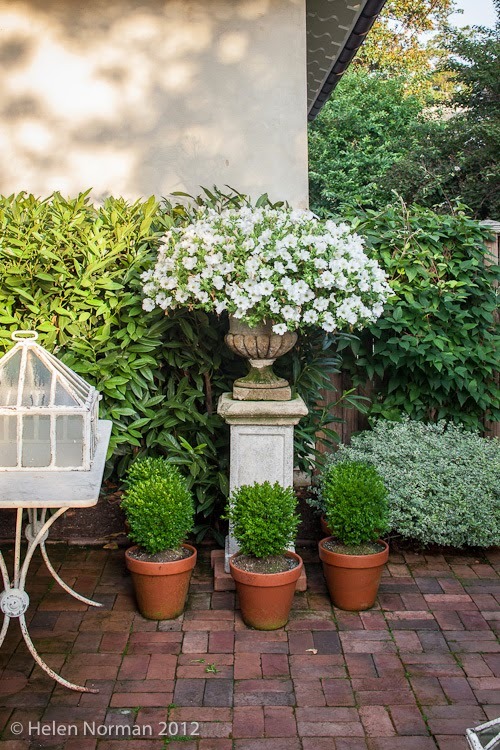 In spring, the azaleas and alliums look so fresh with their white blooms. 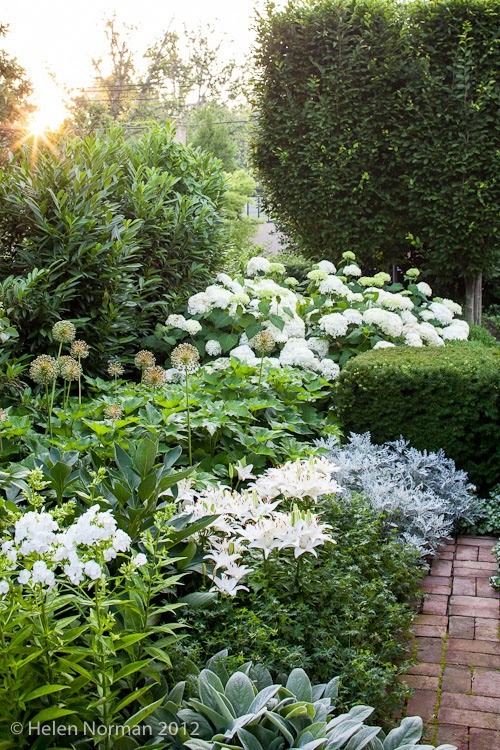 In summer, this white border is at its peak with a showstopping display of white daisies, hydrangeas, irises, lilies and phlox. 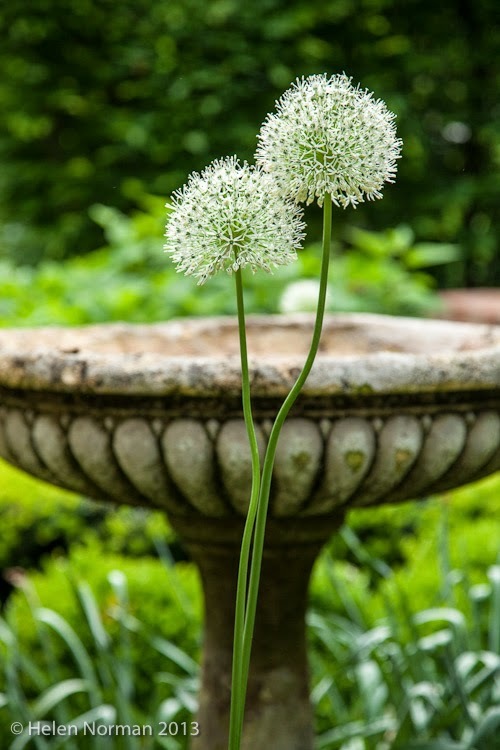 ABOVE: Long after the flowers fade, I keep the allium seed pods around for texture, height and drama. 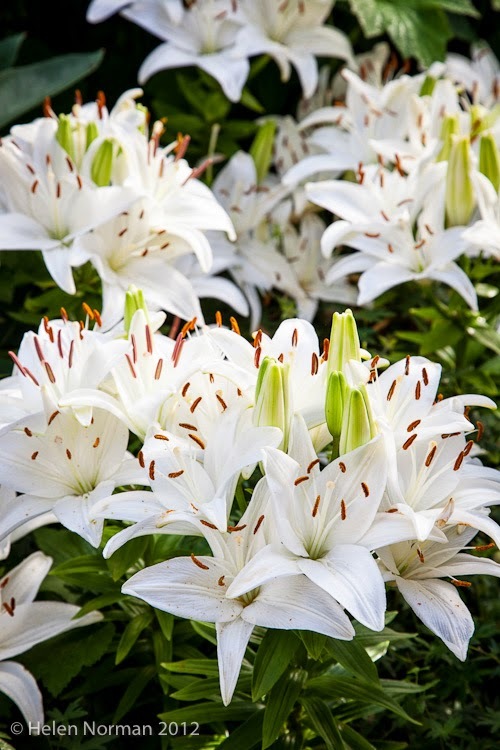 BELOW: Asiatic lilies are both pretty and fragrant. 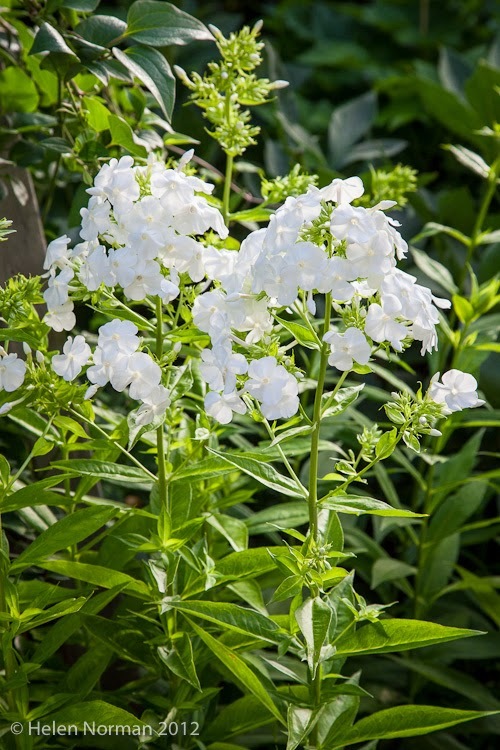 ABOVE: David phlox is a prolific blooming perennial. Looking down the white border. 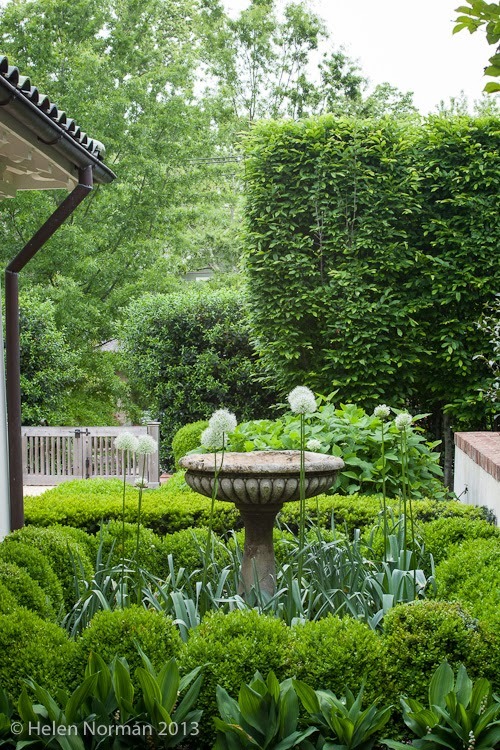 This intimate garden is adorned with some of my favorite ornaments such as the cloches, sundial and obelisk. 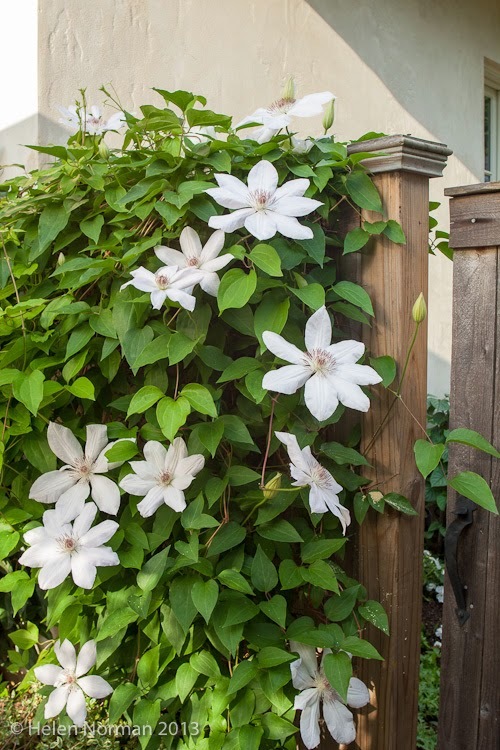 A second flush of blooms from clematis Miss Bateman. 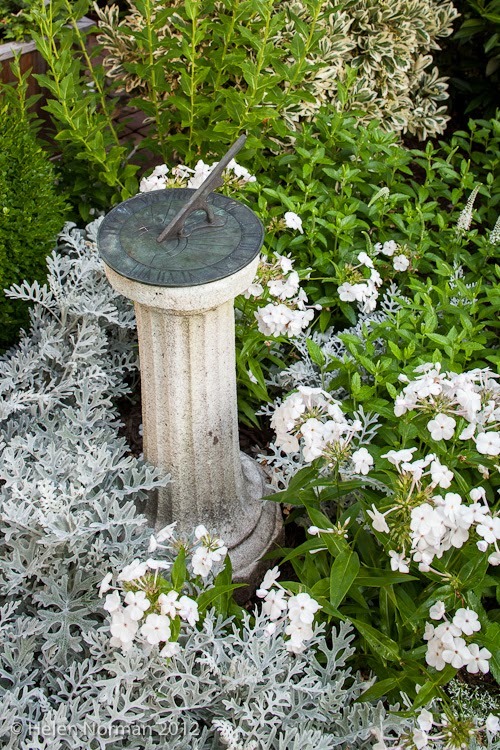 Tucked among dusty millers and phlox is a simple granite sundial. 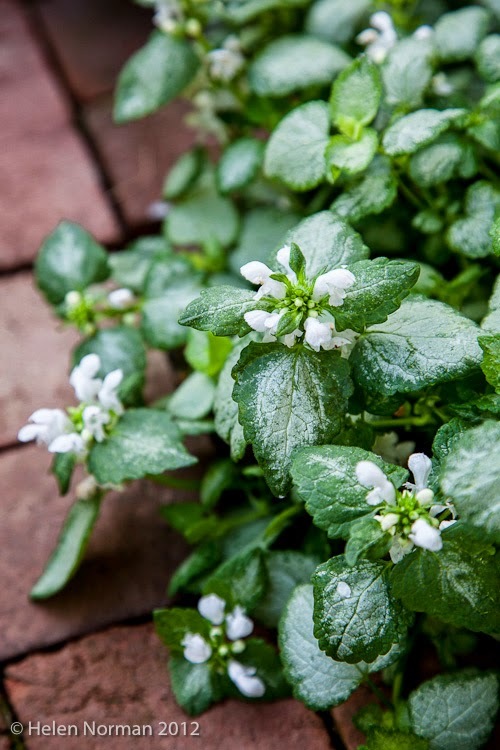 In an all white garden, foliage is especially important. 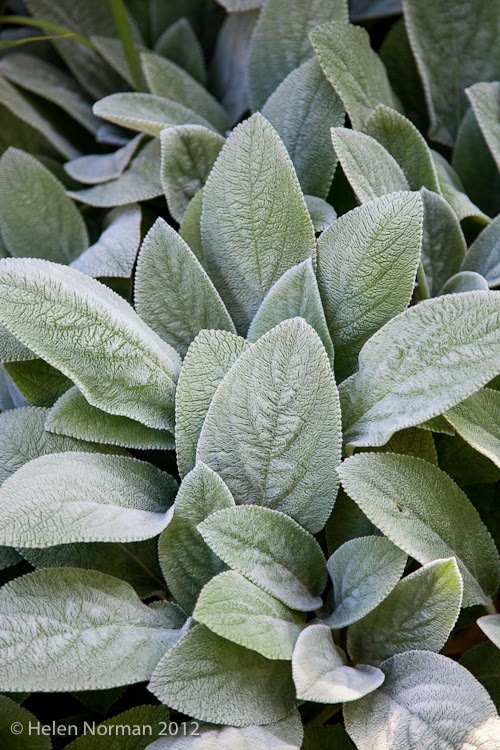 Combine silvery, gray and variegated foliage for texture and interest. 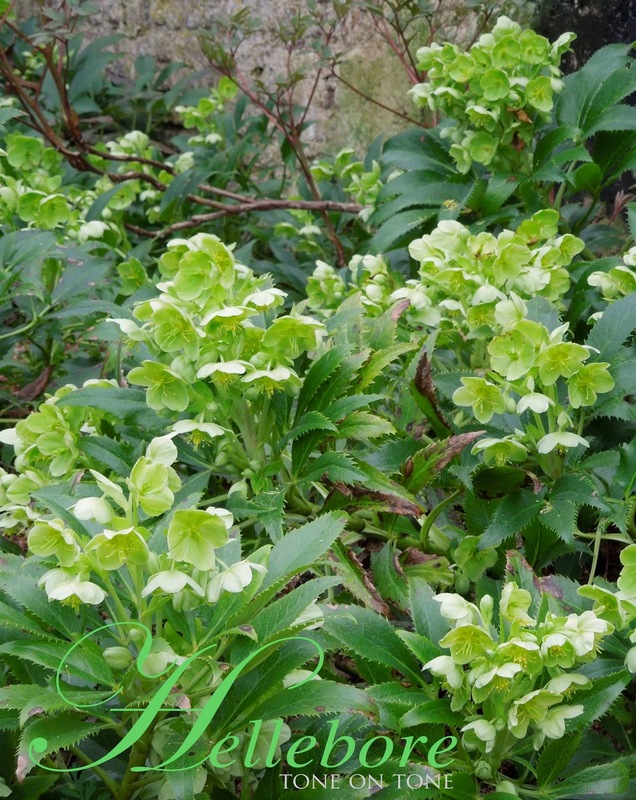 The fuzzy gray foliage of Lamb's ears (above) and variegated lamium (below) are must-haves in the white garden. There are many more photos which I'm saving for another post. I hope you'll pick up the April 2014 Southern Living issue!